The veneration of the dead, including one's ancestors, is based on love and respect for the deceased. In some cultures, it is related to beliefs that the dead have a continued existence, and may possess the ability to influence the fortune of the living. Some groups venerate their direct, familial ancestors; some faith communities, in particular the Catholic Church, venerate saints as intercessors with God, as well as praying for and to departed souls in Purgatory. Most cultures who practice ancestor veneration do not call it "ancestor worship." In English, the word worship usually refers to the reverent love and devotion accorded a deity (god) or God. However, in other cultures, this act of worship does not confer any belief that the departed ancestors have become some kind of deity. Rather, the act is a way to respect, honor and look after ancestors in their afterlives as well as seek their guidance for their living descendants. In this regard, many cultures and religions have similar practices. Some may visit the graves of their parents or other ancestors, leave flowers and pray to them in order to honor and remember them, while also asking their ancestors to continue to look after them. However, this would not be considered as worshipping them since the term worship shows no such meaning. Although some historians claim that ancient Egyptian society was a “death cult” because of its elaborate tombs and mummification rituals, it was the opposite. The philosophy that “this world is but a vale of tears” and that to die and be with God is a better existence than an earthly one was relatively unknown among the ancient Egyptians. This was not to say that they were unacquainted with the harshness of life; rather, their ethos included a sense of continuity between this life and the next. The Egyptian people loved the culture, customs and religion of their daily lives so much that they wanted to continue them in the next—although some might hope for a better station in the Beautiful West (Egyptian afterlife). Tombs were housing in the Hereafter and so they were carefully constructed and decorated, just as homes for the living were. Mummification was a way to preserve the corpse so the ka (soul) of the deceased could return to receive offerings of the things s/he enjoyed while alive. If mummification was not affordable, a “ka-statue” in the likeness of the deceased was carved for this purpose. The Blessed Dead were collectively called the akhu, or “shining ones” (singular: akh). They were described as “shining as gold in the belly of Nut" (Gr. Nuit) and were indeed depicted as golden stars on the roofs of many tombs and temples. If the heart was in balance with the Feather of Ma'at, the ka passed judgment and was granted access to the Beautiful West as an akh who was ma’a heru (“true of voice”) to dwell among the gods and other akhu. At this point only was the ka deemed worthy to be venerated by the living through rites and offerings. Those who became lost in the duat or deliberately tried to avoid judgment became the unfortunate (and sometimes dangerous) mutu, the Restless Dead. For the few whose truly evil hearts outweighed the Feather, the goddess Ammit waited patiently behind Wesir’s judgment seat to consume them. She was a composite creature resembling three of the deadliest animals in Egypt: the crocodile, the hippopotamus and the lion. (The hippopotamus is still the leading cause of human deaths by animal encounter in Africa today.) Being fed to Ammit was to be consigned to the Eternal Void, to be “unmade” as a ka. Besides being eaten by Ammit, the worst fate a ka could suffer after physical death was to be forgotten. For this reason, ancestor veneration in ancient Egypt was an important rite of remembrance in order to keep the ka “alive” in this life as well as in the next. Royals, nobles and the wealthy made contracts with their local priests to perform prayers and give offerings at their tombs. 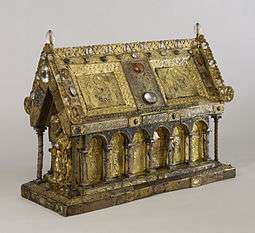 In return, the priests were allowed to keep a portion of the offerings as payment for services rendered. Some tomb inscriptions even invited passers-by to speak aloud the names of the deceased within (which also helped to perpetuate their memory), and to offer water, prayers or other things if they so desired. In the private homes of the less wealthy, niches were carved into the walls for the purpose of housing images of familial akhu and to serve as altars of veneration. The Romans, like many Mediterranean societies, regarded the bodies of the dead as polluting. During Rome's Classical period, the body was most often cremated, and the ashes placed in a tomb outside the city walls. Much of the month of February was devoted to purifications, propitiation, and veneration of the dead, especially at the nine-day festival of the Parentalia during which a family honored its ancestors. The family visited the cemetery and shared cake and wine, both in the form of offerings to the dead and as a meal among themselves. The Parentalia drew to a close on February 21 with the more somber Feralia, a public festival of sacrifices and offerings to the Manes, the potentially malevolent spirits of the dead who required propitiation. One of the most common inscriptional phrases on Latin epitaphs is Dis Manibus, abbreviated D.M, "for the Manes gods," which appears even on some Christian tombstones. The Caristia on February 22 was a celebration of the family line as it continued into the present. Ancestor veneration is prevalent throughout Africa, and serves as the basis of many religions. It is often augmented by a belief in a supreme being, but prayers and/or sacrifices are usually offered to the ancestors who may ascend to becoming a kind of minor deities themselves. Ancestor veneration remains among many Africans, sometimes practiced alongside the later adopted religions of Christianity (as in Nigeria among the Igbo people), and Islam (among the different Mandé peoples and the Bamum) in much of the continent. 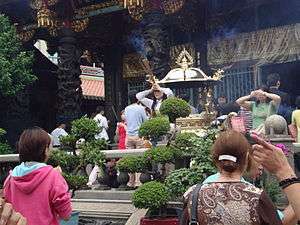 The ancestral veneration in Taiwan is about the same. 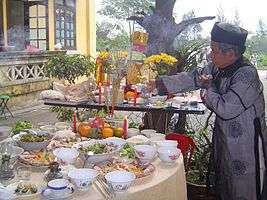 In Vietnam, traditionally people did not celebrate birthdays (before Western influence), but the death anniversary of a loved one was always an important occasion. 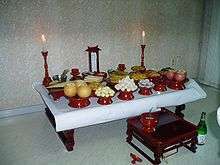 Besides an essential gathering of family members for a banquet in memory of the deceased, incense sticks are burned along with hell notes, and great platters of food are made as offerings on the ancestor altar, which usually has pictures or plaques with the names of the deceased. Ancestors are acknowledged and honoured in India among Hindus. In India, when a person dies, the family observes a thirteen-day mourning period, generally called śrāddha. A year thence, they observe the ritual of Tarpan, in which the family makes offerings to the deceased. 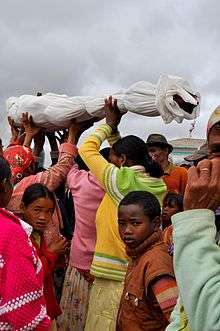 During these rituals, the family prepares the food items that the deceased liked and offers food to the deceased. They offer this food to crows as well on certain days as it is believed that the soul comes in the form of a bird to taste it. They are also obliged to offer śrāddha, a small feast of specific preparations, to eligible Bramhins. Only after these rituals are the family members allowed to eat. It is believed that this reminds the ancestor's spirits that they are not forgotten and are loved, so it brings them peace. However, no one prays to ancestors. On Shradh days, people pray that the souls of ancestors be appeased, forget any animosity and find peace. Each year, on the particular date (as per the Hindu calendar) when the person had died, the family members repeat this ritual. The practice of ancestor worship in Punjab is called Jathera (Punjabi: जठेरा, from जेष्ठ which means the elder), in Haryana shrine for ancestor worship of the village deity is called dhok (Haryanvi: धोक, from dahak (fire), meaning worship) or bhaiyan (Haryanvi: भईयाँ, from भूमिया, meaning of land). The predominantly Roman Catholic Filipino people still hold ancestors in particular esteem—though without the formality common to their neighbours—despite having been Christianised since coming into contact with Spanish missionaries in 1521. 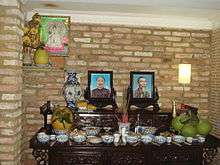 In the present-day, ancestor veneration is expressed in having photographs of the dead by the home altar, a common fixture in many Filipino Christian homes. Candles are often kept burning before the photographs, which are sometimes decorated with garlands of fresh sampaguita, the national flower. Ancestors, particularly dead parents, also traditionally function as psychopomps, as a dying person is said to be brought to the afterlife (Tagalog: sundô, "fetch") by the spirits of dead relatives. It is said that when the moribund call out the names of deceased loved ones, the spirits of those particular people are said to be visible to the dying person, waiting at the foot of the deathbed. Amongst the animistic tribes in the northern Philippines, worshipping the ancestors was prevalent until the American Occupation in 1898. 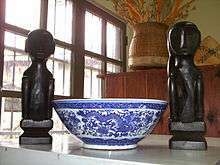 Unlike in other places such as the Christianised lowlands, the tribes' traditional religious images were preserved as part of their rich cultural heritage. Many of these carved wooden ancestors, known as the bulul, are preserved in museums and serve as a reminder of the highlanders' sophisticated history and culture. In Catholic countries in Europe (continued later with the Anglican Church in England), November 1 (All Saints' Day), became known and is still known as the day to honor those who've died and who've been deemed official saints by the Church. November 2, (All Souls Day), or "The Day of the Dead," is the day when all of the faithful dead are remembered. On that day, families go to cemeteries to light candles for their dead relatives, leave them flowers, and often to picnic. The evening before All Saints' -- "All Hallows Eve" or "Hallowe'en"—is unofficially the Catholic day to remember the realities of Hell, to mourn the souls lost to evil, and to remember ways to avoid Hell. It's commonly celebrated in the United States and parts of the United Kingdom in a spirit of light-hearted horror and fear, which is marked by the recounting of ghost stories, bonfires, wearing costumes, carving jack-o'-lanterns, and "trick-or-treating" (going door to door and begging for candy). Native cultures of the original inhabitants of North America honoured the dead with various traditional ceremonies, including food offerings and prayers. Many Mexicans celebrate Dia de Muertos (Day of the Dead) on or around All Saints Day (November 1), this being a mix of a native Mesoamerican celebration and an imported European holiday. Ofrendas (altars) are set up, with calaveras (sugar skulls), photographs of departed loved ones, marigold flowers, candles, and more. Islam has a complex and mixed view on the idea of grave shrines and ancestor worship. The graves of many early Islamic figures are holy sites for Muslims, including Mohammed, Ali, and a cemetery with many companions and early caliphs. Many other mausoleums are major architectural, political, and cultural sites, including the National Mausoleum in Pakistan and the Taj Mahal in India. However, the religious movement of Wahhabism views this veneration of graves as a form of idolatry. Followers of this movement have destroyed many gravesite shrines, including in Saudi Arabia and in territory controlled by the Islamic State. ↑ Dávid-Barrett, Tamás; Carney, James (2015-08-14). "The deification of historical figures and the emergence of priesthoods as a solution to a network coordination problem". Religion, Brain & Behavior. 0 (0): 1–11. doi:10.1080/2153599X.2015.1063001. ISSN 2153-599X. ↑ Whitehouse, Harvey (2004). Modes of Religiosity. A Cognitive Theory of Religious Transmission. Alta Mira Press. ISBN 0-7591-0615-0. ↑ Atran, Scott; Norenzayan, Ara (2004-12-01). "Why minds create gods: Devotion, deception, death, and arational decision making". Behavioral and Brain Sciences. 27 (06): 754–770. doi:10.1017/S0140525X04470174. ISSN 1469-1825. ↑ Michele Renee Salzman, "Religious koine and Religious Dissent," in A Companion to Roman Religion (Blackwell, 2007), p. 116. ↑ Salzman, "Religious Koine," p. 115. ↑ William Warde Fowler, The Roman Festivals of the Period of the Republic (London, 1908), p. 418. ↑ R.G. Lewis, "Imperial Autobiography, Augustus to Hadrian," Aufstieg und Niedergang der römischen Welt II.34.1 (1993), p. 658. ↑ Some reflections on ancestor workship in Africa, Meyer Fortes, African Systems of Thought, pages 122-142, University of Kent. ↑ Bureau of African Affairs (3 May 2011). "Background Note: Madagascar". U.S. Department of State. Archived from the original on 24 August 2011. Retrieved 24 August 2011. ↑ Bearak, Barry (5 September 2010). "Dead Join the Living in a Family Celebration". New York Times. p. A7. Archived from the original on 13 January 2012. Retrieved 13 January 2012. ↑ Ancestor Worship and Korean Society, Roger Janelli, Dawnhee Janelli, Stanford University Press, 1992. ISBN 0-8047-2158-0. 1 2 Park, Chang-Won (10 June 2010). Cultural Blending in Korean Death Rites. Continuum International Publishing Group. pp. 12–13. ISBN 978-1-4411-1749-6. ↑ Bae, Choon Sup (August 2007). "The Challenge of Ancestor Worship in Korea" (PDF). University of Pretoria. ↑ Rambo, A. Terry (2005). Searching for Vietnam: selected writings on Vietnamese culture and society. Trans Pacific Press. p. 75. ISBN 978-1-920901-05-9. ↑ Sadan, Mandy (2005). Monique Skidmore, ed. Burma at the turn of the twenty-first century. Hawaii: University of Hawaii Press. pp. 90–111. ISBN 978-0-8248-2897-4. 1 2 Harvey, G. E. (1925). History of Burma. Longmans. pp. 327–328. ↑ Spiro, Melford E. (1978). Burmese Supernaturalism. Transaction Publishers. pp. 69–70. ISBN 978-1-56000-882-8. ↑ Underhill, M M (2001). The Hindu religious year. Asian Educational Services. pp. 112–116. ISBN 978-81-206-0523-7. ↑ Sastri, S. M. Natesa (1988). Hindu feasts, fasts and ceremonies. Asian Educational Services. pp. 15–17. ISBN 978-81-206-0402-5. ↑ Sharma, Usha (2008). "Mahalaya". Festivals In Indian Society. 2. Mittal Publications. pp. 72–73. ISBN 978-81-8324-113-7. ↑ Marti Patel, "Trance Dancing and Spirit Possession in Northern Thailand", 19 November 2010. 1 2 Davies, John; Jenkins, Nigel (2008). The Welsh Academy Encyclopaedia of Wales. Cardiff: University of Wales Press. ISBN 978-0-7083-1953-6. ↑ Moore, A.W. (ed) Manx Ballads & Music (1896) G & R Johnson, Douglas. ↑ http://www.orchadash-tucson.org/rabbi-mourning-customs.html Archived July 21, 2015, at the Wayback Machine.